Cylindrical structure supporting the cell and allowing organelles and substances inside the cell to move about. Rod-shaped structure supporting the cell and giving it its shape. Organelle containing enzymes that neutralize the cell’s toxic substances. Mass of very fine filaments of DNA, the genetic material of the cell; it is compressed into chromosomes during cell division. Organelle, free or attached to the endoplasmic reticulum, producing proteins essential to the constitution and functioning of living beings. 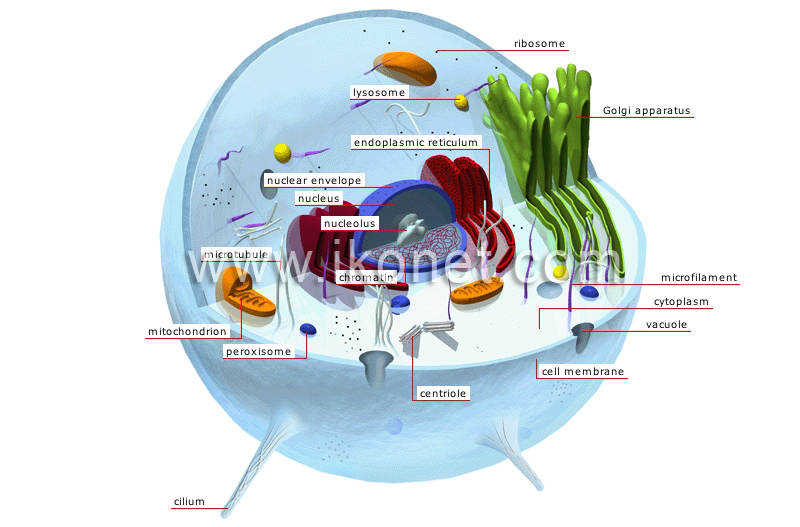 Organelle formed of walls to which the ribosomes are attached. Small spheroid organ containing enzymes that break down food, spent cell components and other harmful substances that have been absorbed. Envelope formed of two layers surrounding the nucleus and pierced with small holes, which allow exchanges between the cytoplasm and the nucleus. Structure consisting of small rods that play a major role in cell division. Each cell usually contains two.